Honolulu's 'Distracted Walking' Law Takes Effect, Targeting Phone Users : The Two-Way Under the new law, the only legal reason for a pedestrian to look at a cellphone while crossing a street would be to call 911. For repeat offenders, fines could run up to nearly $100. 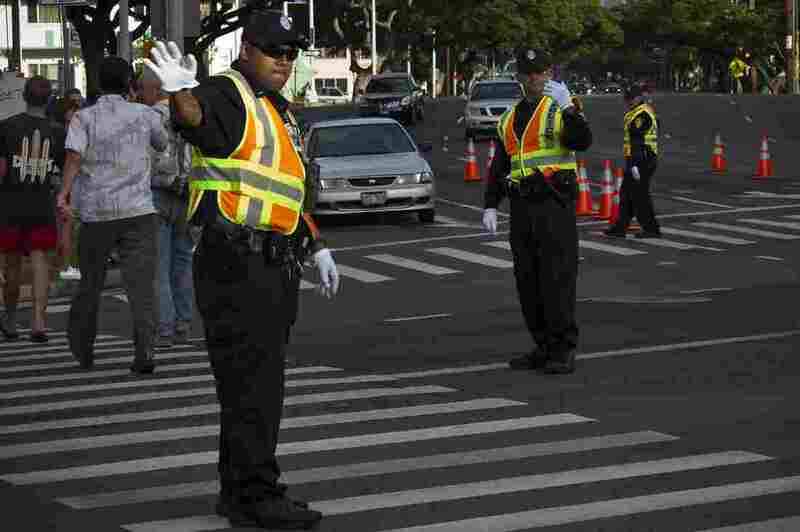 Honolulu police officers direct traffic at an intersection. Honolulu is the first major U.S. city to ban texting while walking in a crosswalk. Police in Honolulu on Wednesday will begin writing tickets for people who get distracted by their cellphones while walking in a crosswalk. Honolulu is the first major city in the country to pass such a law, citing a high rate of pedestrians being hit in crosswalks. "Starting today, texting while walking in a crosswalk can get you a ticket," Hawaii Public Radio's Bill Dorman reports for our Newscast unit. "In fact, a downward glance at a screen of any kind will cost you — a phone, a tablet, a video game." Under the new law, the only legal reason for a pedestrian to use a cellphone while crossing a street or highway would be to call 911 to report an emergency. Minimum fines for breaking the new law start at $15; for repeat offenders, the penalty ranges from $75 to $99. Higher rates — up to $100 for a first offense, $200 for a second, and $500 for a third — had been considered earlier this year. Mayor Kirk Caldwell signed Bill 6, also known as the Distracted Walking Law, in July. At the time, he said that Honolulu held "the unfortunate distinction of being a major city with more pedestrians being hit in crosswalks, particularly our seniors, than almost any other city in the county," as NPR's Miles Parks reported. According to HPD, more than 10,000 citations were issued last year for mobile electronic device violations. As the law took effect, the city of Honolulu cited a National Safety Council warning that when pedestrians use a cellphone, "this distraction can cause them to trip, cross roads unsafely or walk into motionless objects such as street signs, doors or walls." After thousands of distracted walking injuries were reported, the NSC says, it added a new category to track the trend in its annual statistical report, Injury Facts. In the 90 days since the bill was signed, Honolulu police have been working to remind people of the risks of using an electronic device while walking across a street — risks that, as of Wednesday, also include a fine.